Even minor flooding can cause lasting damage to your home and belongings, as well as pose health risks for your family. And major flooding will cause extensive damage if just pumped out. Lingering wetness will quickly destroy carpet, gypsum board walls, furniture, appliances, drapes, and more. If it’s a single room you may be able to tackle flood cleaning yourself. With anything more than that you’ll likely be overwhelmed with all the different types of damage that occur all at once. This post hits some of the highlights, but if you choose to take care of things yourself it’s absolutely vital that you educate yourself with detailed instructions from elsewhere. Although professional flood cleanup services are highly recommended by experts, there are important steps you can take… but at your own risk. There are too many safety precautions for the various activities to go into here, so I’ll mention two of the most important. First, make sure that power is shut off before entering the affected area to avoid the possibility of electrocution. Second, wear protective eye gear and a mask, especially if there’s evidence of mold, dirty water, or sewage contamination. Fast action to dry everything out as quickly as possible is vital, as serious water damage can begin in as little as a day. You should also call your insurance agent immediately to report the loss. Actually filing a claim will come later, after you’ve taken steps to prevent further damage and know exactly what the damage and losses are. Of course the first step is to remove any standing water and mud and take care of sanitation. The next step is removing contents such as furniture, drapes, bedding, rugs, and clothing from the affected area into a dry area to avoid further contamination and to help everything dry faster. Everything, including floors, walls, and ceilings, should be washed with a strong cleaner and then be disinfected. Then make sure they’re thoroughly dried out. Diluted chlorine bleach is good for some items, but can damage non-colorfast materials, nylon, and others. Dishes and utensils should be placed in boiling water for 10 minutes (chlorine discolors metal items). To begin the drying process, use a wet-vac or carpet cleaner to extract as much water as possible. Then lift up the carpet to promote drying from both sides, and discard the padding (it’s simply not possible to adequately clean it). If carpets have been underwater for over 24 hours or have been exposed to sewage they’re very likely unsalvageable and should be discarded. Once the room and especially the underfloor are thoroughly dry, reinstall the carpet with new padding and thoroughly clean. Mold is a major concern with any sort of water problem, posing health risks, damaging materials, and spreading through invisible airborne spores. For very minor outbreaks possessions can be taken outdoors and brushed off. Inside you should vacuum the floors, walls, and ceilings. Then follow up with a disinfectant. Major outbreaks require professional mold remediation for safety and thorough removal. Water quickly soaks in deeply to where it can take weeks or longer to thoroughly evaporate under natural conditions. Yet even excess moisture damages wood and wallboard in a matter of days, causing warping, splitting, and decay. Given enough time even concrete is weakened. Even after removing carpet and linoleum, sub-flooring can take a month to fully dry. Homeowners can use strong exhaust fans as well as air conditioning or dehumidifiers (but not heaters — that promotes the growth of mold and bacteria) to speed up drying. Water also wicks up inside walls, so that it’s often necessary to remove baseboards and a foot or more of wallboard or paneling at the floor, and even make openings near the ceiling. But even then there’s a high risk of further water damage and health hazards. 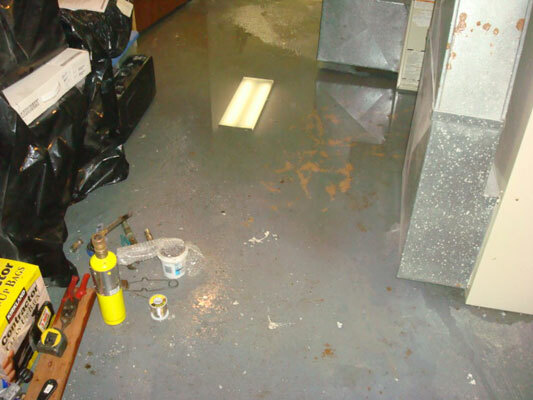 Professional flood and water damage restoration services have special equipment and skills that can get moisture back to safe levels in a matter of a few days. Here are a few other items that should be on your checklist. If wet or damp, mattresses, cushions, pillows, stuffed animals, and the like should be discarded. Carefully clean and inspect appliances inside and out before plugging them in and turning them on. When in doubt, replace them. Inspect duct work and your heater and air conditioner for wetness, mold, and damage. Check electrical sockets for mud and corrosion. Yes, that’s a lot of work and countless opportunities to invite trouble. If there’s been extensive flooding, mold or sewage issues, or water has been present for a day or more experts strongly recommend bringing in flood and water damage experts. And many insurance companies require it immediately, otherwise they won’t cover any subsequent damage. Experts also recommend that upholstered furniture be treated by specialists. In addition to extensive training and experience, professional flood repair and water damage remediation companies have special equipment such as high-capacity pumps, extra-powerful water extractors, powerful air movers, and refrigerant dehumidifiers as well as special heaters and blowers for drying out the insides of walls. All combined they provide complete structural dry out in a matter of days rather than weeks or months. The first day is most critical, so such services should be available 24/7. Joe Kielbasa’s Flood Service is ready to take care of all this. There’s no work for you, and you’ll keep your family safe while minimizing repair costs.